HALT, from Vaaasm is a wacky run-and-gun actioner starring a group of law enforcement officers managed by a private company. You take on the roles of officers Chris Tracy and Turner Chase who are investigating the members of a criminal organization known as "The Human". 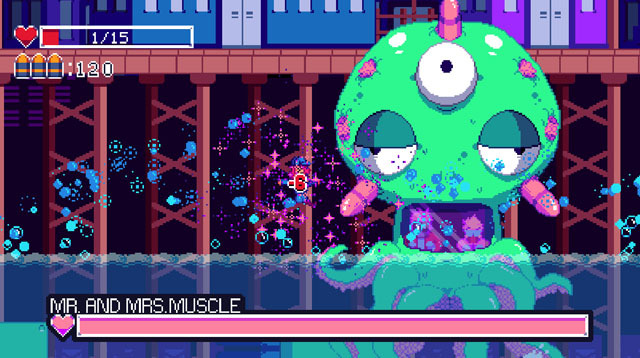 The duo blast their way through an eclectic array of baddies in the form of skeleton robots, turtles, mutant bees, and even a flying squid submarine. Players have access to a variety of weapons and ammo, and dozens of upgrades, allowing them to modify their weapons for heavy fire, bouncing bullets, freeze bullets, explosives, and biological weapons... or just drop a couple of turrets into the level and spray everything with a barrage of hot lead. The game is coming to PC and Mac but does not yet have an announced release date.